Peter Phillips will be our MC and first speaker. Professor of Sociology at Sonoma State University and former Director of Project Censored, Peter currently co-hosts The Morning Show on KPFA and is President of The Media Freedom Foundation. Richard Gage, AIA, is well known to many in the Bay Area. He is the dynamic founder of Architects and Engineers for 9/11 Truth, which has grown to 1500 petition signing professionals. He will update us on the many recent activities of AE911Truth. Introducing Kathy McGrade, a Silicon Valley engineer now affiliated with AE911Truth. Her work includes ensuring the safety of firefighters during structural fires. She presents a sharp critique of the government's account for the demise of the three WTC Towers. As part of his long and distinguished career, Bob Bowman ran for President in 2000 and for the US Congress in 2006. Bob Scheer of the LA Times called him “probably the best public speaker in the country today.” Dr. Bowman will give new voice to several of his recurrent themes-no more imperial presidency, no more undeclared corporate wars, no more spying on the American people, no more repression of dissidents, no more exporting of jobs, no more government lies, false-flag attacks, and cover-ups. Two term Senator from Alaska Mike Gravel first gained national attention when he read the Pentagon Papers into the Congressional Record. For the last two decades, he has worked to establish a National Initiative process to empower citizens. Mike ran for president in 2008, and more recently is leading efforts for a series of state initiatives calling for a new, independent investigation of 9/11. They are doing a 3 1/2 hour show on 9/11 ! ! ! 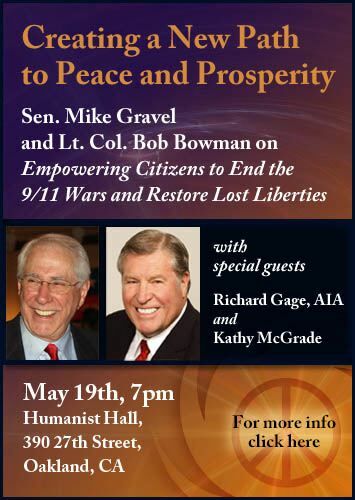 Btw, I'm the lead producer of the Bowman/Gravel event and also working with 911tv.org to video record the event, which will be available online and via DVD. LeftWright on Thu, 05/19/2011 - 2:20pm. "Two hero world US citizens.. Former Senator Mike Gravel brought the attention of Dan Ellsberg's Pentagon Papers into the Congressional record. Robert Bowman became a whistleblower during the Reagan years regarding the lies built upon missile 'defense.' Both of these two are truthtellers when it comes to the events of September 11, and are working to gain a new and real investigation." jonathan mark on Thu, 05/19/2011 - 3:22pm. How easy is it for the MSM to ignore them? One would also think that some honest, open-minded journalists would find "creative" ways of bringing up the efforts Gravel and Bowman. Vesa on Thu, 05/19/2011 - 5:34pm. We had a full house (around 130 people) and many new faces (always a good thing). We broke even (also always a good thing). We got some excellent video (stay tuned for a dvd and the video will get posted asap, audio available now at noliesradio.org, please see above). The event ran on time (always makes me happy). Expect more from engineer Kathy McGrade soon, she really knows how to tear up the NIST report on WTC 7 and is a wonderful speaker. Thanks to everyone who helped, especially Peter Phillips of Project Censored. LeftWright on Fri, 05/20/2011 - 10:50am. Thanks for all your energy too. It was nice seeing new people. I think the KPFA special was incredible planning, and succesful, to have just hours before the live event. grumpy brian on Fri, 05/20/2011 - 12:03pm. Thank you for all your help, too. Yes, we really lucked out with the KPFA broadcast for 3 1/2 hours (lots of pledge breaks) only hours before the event. Always great to work with Project Censored and noliesradio.org, too. LeftWright on Fri, 05/20/2011 - 11:09pm. showing video on sept. 8th.. I am considering showing this presentation when it is available on DVD at the Media Education Foundation in Northampton, MA on September 8, after tabling around county courthouses with the AE911truth campaign. Let me know when a DVD is available. Thanks again for setting up such an excellent program. Congratulations! jonathan mark on Sat, 05/21/2011 - 5:31pm.